Why does the classic song The Night They Drove Old Dixie Down continue to move us 45 years after The Band first recorded it? The fact that so many people continue to debate its meaning online (see links here, here, here and here) is a mirror of America’s ongoing uncertainty about the motives of the war’s opposing sides, of its resolution and of its meaning for our time. In other words, the war (and the Viet Nam war during which The Night was composed) is still not over. It is hard for me to comprehend how any Northerner, raised on a very different war than Virgil Kane’s, could listen to this song without finding himself changed. You can’t get out from under the singer’s truth – not the whole truth, simply his truth – and the little autobiography closes the gap between us. The performance leaves behind a feeling that for all our oppositions, every American still shares this old event; because to this day, none of us has escaped its impact. What we share is an ability to respond to a story like this one. By May the 10th Richmond had fell, it was a night I remember oh so well. (Ulysses S.) Grant’s instructions were grimly specific. He wanted the rich farmlands so thoroughly despoiled that the place could no longer support a Confederate army; he told (General Phillip) Sheridan to devastate the whole area so thoroughly that a crow flying across the Valley would have to carry its own rations. The siege of Richmond lasted ten months. In the last days before the fall, both the army and the civilian population were starving, and thousands died. 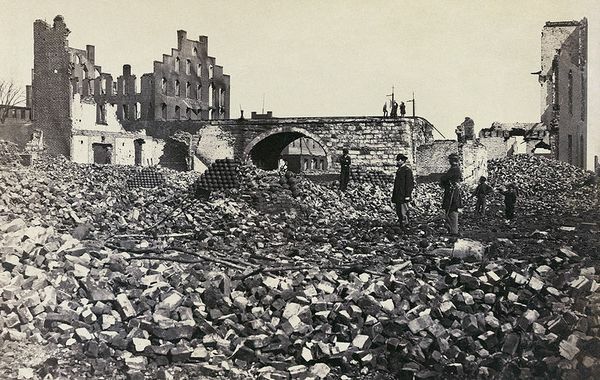 The Confederates set the city on fire before they left to deny Union troops any usable resources. May 10 actually marked the capture of Confederate President Jefferson Davis and the definitive end of the Confederacy. Can we imagine the suffering? Does it matter that these people were defending an unjust racial and economic system? Caine is not concerned with retribution or punishment. He merely asks us to know his despair. That despair, however, lives within a primary mythic theme: The Lost Cause. For generations after the war, white Southerners, in an extended but highly selective memory, mourned the destruction of a noble, refined, chivalrous “way of life.” The myth explained their military defeat with a story that only the North’s massive numerical and industrial force could overwhelm the South’s superior military skill and courage. The myth, of course, did not care to examine the underlying causes of the war. That’s one reason why it still retains such emotional resiliency. War became impersonal and industrialized, with the objective of maximizing the killing. But even though technology had changed things irrevocably, tactics didn’t change; old men sent young men marching in closed ranks against massed cannonry and repeating rifles. Six hundred thousand died and 500,000 were wounded, in a country of thirty million. One-fifth of the South’s adult white male population perished. A hundred and fifty years later, we wonder why several hundred thousand dirt-poor whites who couldn’t afford to own slaves defended this cause so savagely. We must conclude that they fought not to save slavery (which was against their own economic interests), but to perpetuate white privilege. It was all they had. We could also ask why the descendants of these people continue to vote against their own economic interests, and we have to conclude, as I did here, that the fear of losing their white privilege remains their primary motivation. We could also ask whether the South actually won the war. The song, however, says nothing of these things. To Virgil’s credit, we can assume that his primary motivation had been simply to defend his family. And he had been unsuccessful. The South was the only American region to ever undergo occupation by an enemy power. Below the glorious myth of the Lost Cause, there remained a deep sense of crushing defeat. You take what you need and leave the rest, but they should never have taken the very best. In any event, Virgil has a brief, final glimpse of the man who personified the cause, the officer he once would have died for. But the memory soon fades, and he is left with the grim reality of having to chop wood (probably for someone else) for a living, because his Confederate dollars are worthless. But the vision of the great man has stimulated something else. Exactly whom is Virgil addressing when he laments, “You take what you need and leave the rest”? The Northern armies, occupiers and carpetbaggers? A generalized “you”? Himself? I don’t think so. I think that he’s addressing General Lee and all of his generation on both sides, all of the politicians, industrialists, plantation owners, clergy, newspapermen and anyone else among the generation of the fathers who sat comfortably in their armchairs as their sons marched into the furious cannonades at Gettysburg, where over fifty thousand were killed or injured in three days. He is addressing the great God Kronos, the eater of his own children. “…They should never have taken the very best,” wails Virgil, thinking undoubtedly of his brother who will die in the third verse. What Virgil doesn’t understand, however, is that the point, the very essence of human sacrifice is in fact to offer up the very best of the younger generations to the infinite hunger of the gods of the new order. How else to justify the madness of history but through such sacrifice: It must have been worth it! Look what we gave up!